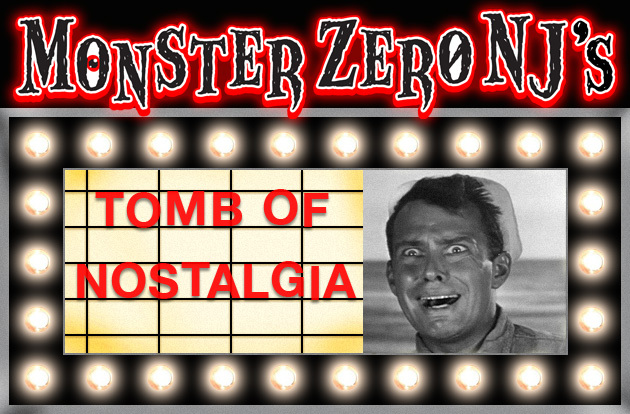 MONSTERZERO NJ’S 12 FAVORITE CLASSICS AND CULT CLASSICS I SAW AT THE LEGENDARY ORITANI THEATER! If you’ve been visiting this site for a while you’ve probably heard me mention more than once, The Oritani Theater in Hackensack, N.J. The Oritani was a grind house, that presented badly dubbed martial arts movies, horror flicks, and raunchy low budget comedies during the late seventies and early 80s. I lived only a town away, so this was a go-to theater on a Friday and Saturday night for my friends and I, who shared a love of B-Movie horror and sci-fi. I decided to compose a list of 12 favorite flicks that I saw there, which are now regarded as classics, cult classics, or fan favorites. Some of these were seen when first released and a few of the older titles were at revivals or midnight shows there! 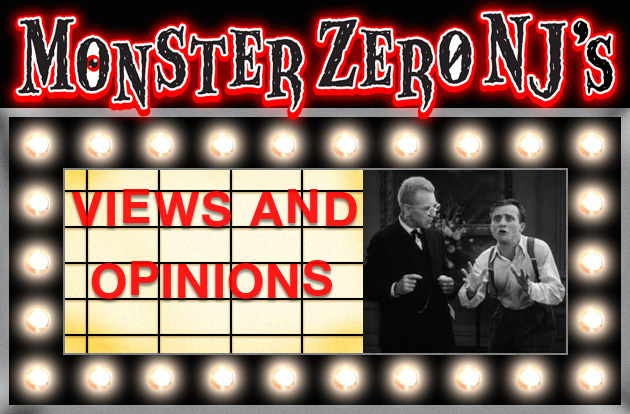 Click on the titles here to go to the review page for the corresponding movie! John Carpenter’s Halloween may not have been the first slasher, but it is the film whose success started the early 80s slasher trend as studios and indie filmmakers realized you could make a lot of money on a shoestring budget. The early 80s cinemas became filled with films that followed the slasher formula with the stories being set on or around a special event or time, such as the prom in Prom Night, or college hazing as in Hell Night, or a fateful day like Friday The 13th. And then, within that setting, having a group of young high school or college co-eds being stalked and cut down by a killer with a grudge, till one feisty young girl…or sometimes a couple…is left to fend off our killer. For the most part these films took themselves very seriously and had a somber mood and moderate pace with the violence level being anywhere from fairly tame, like in thrillers like Terror Train or over-the-top gory as in Willaim Lustig’s Maniac or Charles Kaufman’s Mother’s Day…though, let’s not forget that some of the gorier entries where a result of the success of George Romero’s ultra-violent Dawn Of The Dead which started it’s own trend of extremely violent horrors that predominately came out of Italy and was spearheaded by filmmakers like Lucio Fulci. There were some rare instances where a director had a more humorous approach like Joe Dante’s The Howling or An American Werewolf in London, but horror/comedy is nothing new and the early 80s horror films predominately followed a more serious direction at this point in time. Monster movies like The Boogens or Without Warning or supernatural horrors like The Fog and The Boogeyman also followed the slasher format with victims being isolated and killed off one by one, leaving a frightened heroine to fend for herself with the occasional surviving love interest to help her survive. And for the first two or three years of the decade, theaters where inundated with such horrors to the delight of screaming fans. And we got many a classic horror flick out of it. But like any trend, such as the 70s possession flick trend inspired by The Exorcist, these things run their course. But not only did 80s horror start to open up with more supernatural themed flicks like the A Nightmare On Elm Street films, that cleverly added an incorporeal villain and surreal elements to the slasher formula, but the films started to reflect the overall buoyant mood of the 80s with brighter cinematography, more humorous tones and even began to reference and acknowledge past films and filmmakers. The first ‘inside’ reference I can remember was Sam Raimi’s subtle shout-out to Wes Craven by having a The Hills Have Eyes poster displayed in the basement of the old cabin in 1981’s The Evil Dead…to which Craven responded by having Heather Langenkamp watching Evil Dead on TV in the first Elm St movie. In terms of the lighter tone, the first time I noticed it was back in 1982 with Friday The 13th Part 3. When I saw it at my beloved Oritani Theater, I was kind of taken back by it all. The film had a very colorful production design, had a lot more humor than the first two installments…including characters that seemed to be there just for comic relief…and seemed to almost be having fun with the fact that we’ve been through this twice before. Jason went from a creepy, deformed backwoodsman to a hulking comic-bookish monster complete with iconic hockey mask. The film’s trademark kills were a bit more elaborate and far-fetched, as if the filmmakers were getting a bit playful with Jason’s M.O. The tone shift seemed to be starting, but without knowing what was to come in following years, I was simply disappointed with the flick and had no idea the trend would continue. And the shift did continue with the advent of Freddy Krueger who was creepy at first, but quickly became a wisecracking, demonic gremlin that pulled people into his dream world for elaborate and outrageously gimmick-laden fates. The movies were far more fun than scary, but these films at least were more creative and imaginative than the simple stalk and kill films that came before them, though I missed the intensity and the serious tone of films like The Prowler. Flicks also started to jokingly reference their inspirations, like 1986’s Night Of The Creeps which names every character after a horror film director of that era like “Chris Romero”, “Cynthia Cronenberg” and James Carpenter-Hooper”. We also got MTV inspired films like the music filled and music video styled Return Of The Living Dead, the classic The Lost Boys, as well as, the neon-lit Vamp. Those films were far more entertaining than they were frightening as The Lost Boys even has a touch of Spielberg in it’s over-all tone…reminding us of the stark example of what happened when Carpenter’s grim and gory extraterrestrial The Thing went up against Spielberg’s bug eyed visitor from E.T. in 1982. No better an example of the start of audience change of taste in the 80s than was the beating Carpenter’s now classic sci-fi/horror got from critics and at the box office…though, I saw it at least three times in a theater! 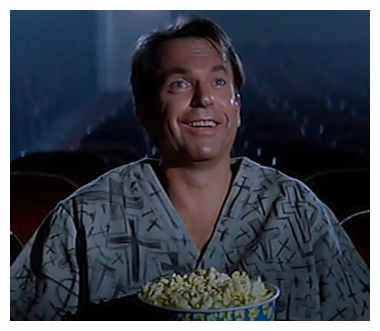 The trend continued with even lighter and more humor-laced films as we headed toward the 90s with flicks such as Waxwork, Chopping Mall and Night Of The Demons which were loaded with as many laughs as they were scares and gore. The MTV generation was being fed films that were faster paced, brightly colored and took themselves far less seriously as the arrival of music video and the end of the Cold War had created an era that was a bit more overindulgent and the films of the day reflected this. Even somewhat more serious horror like 1988s Intruder and the 1985 classic The Re-Animator still openly had a good time with their premises and occasionally winked at the audience, which films now acknowledged were sitting there and were familiar with the type of flick they are seeing. Earlier 80s films rarely acknowledged that they were a movie and that there was a horror savvy audience watching, but the second half of the decade was filled with movies that referenced those earlier films and were quite aware of themselves and who their audience was. They played to that audience instead of simply telling their scary story. And at this point Freddy Krueger was turning girls into giant cockroaches and Jason was a zombie battling telekinetic teenagers. Even the old school boogiemen had traded in their scares for more outrageous and silly story lines with each installment, as almost every horror hit became a franchise. Michael Myers also returned in 1988 to now stalk his young niece…why not his second cousin too? Needless to say by the time 1990 rolled around, horror had become burnt out and silly until horror master Wes Craven would revive it as pop-culture-reference filled heavy nostalgia with a bite in Scream… but that is another story. Another aspect of the shift that may not have been as noticeable to the average audience, but was very noticeable to film buffs was in how these films were now being made and how they looked. By 1985 the home video market was in full swing. I should know, I worked at a Palmer Video back then. Direct to VHS films were starting to appear due to the cost effectiveness of not having to produce film prints for theater showings. And a lot of the horror films of the later decade were being made with the home video market in mind. Even some of the ones that got theatrical releases lacked that theatrical look. Gone were the cinematic visuals and widescreen presentations. Flicks like Witchboard and Waxwork had the look and feel of a TV movie and were filmed in the more TV screen friendly 1:85 format. Only some of the big studio releases and films by veterans like Carpenter and Craven maintained that theatrical look in their visual styles and still looked like a movie made for theaters. A disappointment to those who find the film’s visuals as important as their story and content. And another example of how drastically movies changed from 1980 to 1990. Whatever the course the horror films of the 80s took, I will always have a soft spot in my heart for these movies, good or bad. Whether it be the more serious chillers of the early years, or the reference heavy, lighter toned flicks that came later on, it was a decade when I came of age and was most influenced by movies and was still a time where a low budget flick like Galaxy Of Terror or Final Exam could see the inside of an audience filled theater. And not only was I proudly there to see it, but will never forget it. And now, decades later, many a night when my social calendar is empty, I can be found in a darkened living room, on the couch, with some of my favorite brews, reliving those days long gone, but never…ever…forgotten! … and one of the reasons I now share my passion for those movies with all of you! IS THE ROMANCE GONE IN MOVIE GOING? In an age of corporate run movie theater multi-plexes that are all designed and built the same, I sometimes wonder if the movie going experience hasn’t had the true essence taken away somewhat. And I’m not talking about the rude behavior of other patrons which is a story in itself. I’m talking about how all these big theater chains look alike, so it doesn’t really matter which one you go to other than convenience of proximity or perhaps a dollar or two difference in price. Obviously, if you have been to this site before, you’ve heard me speak of my beloved Oritiani Theater or possibly mention a few other theaters that were and still are of personal importance to me. These were theaters that were individual entities, at least to start with and had their own look, especially the older theaters like the Oritani and the Fox in Hackensack which had beautiful architecture and it gave these theaters their own identities…made them unique. There was something romantic about these old theaters that enhanced the movie going experience, something I think today’s movie audience is sadly denied with cookie-cutter movie theater multi-plexes. Sure you have stadium seating, digital picture and sound and in some places you can order dinner and drinks, but it still comes wrapped in a very generic and souless package. You can’t tell one from the other once inside…and the outsides aren’t exactly special either. Can you become endeared to one of these places such as I did to say, the Park Lane theater in Palisades Park where I saw Jaws and Smokey And The Bandit as a kid, or even the Hyway Theater in Fair Lawn where I saw 80s cult classics like Re-animator and Maniac Cop? These theaters had character and atmosphere. They had their own personality. Today’s theaters…most of which are situated in or next to an equally generic shopping mall…have all the bells and whistles, but for me, anyway, they don’t have the charm or soul of say The Rialto Theater in Ridgefield Park, where I saw the original Friday The 13th on Friday June 13, 1980. Today’s generation of movie goer doesn’t know what it’s like to walk into one of these old theaters to watch a movie bathed in that theater’s atmosphere unless they are lucky enough to live near one of the few remaining such theaters like The Warner Theater in Ridgewood or The Claridge and Bellevue Theaters in Montclair. And even those are split into multiple auditoriums. Only a few like the Fox Theater in Hackensack closed their doors as a single auditorium theater as did also the Queen Anne Theater in Bogota…which was a beautiful old theater that showed only adult movies in the early 80s…and The Rialto theater in Ridgefield Park which closed in recent years after a run as a quaint art-house theater. 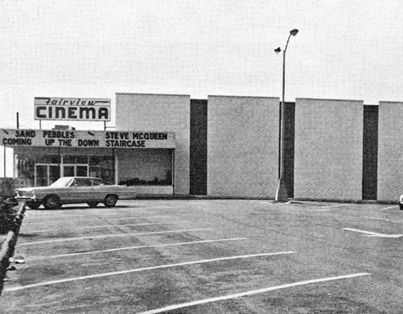 The Fairview Cinema in Fairview NJ, the first movie theater I remember going to. I’m from a different generation and as a film lover and movie geek, I grew up when movie going was about more then just the film, but the experience. The first theater I remember going to was The Fairview Cinema in Fairview, N.J. I remember the excitement I felt when the lights went down and the curtains opened to reveal the screen…that’s an experience all but gone from today’s movie going world, but when I was a kid, a few theaters still had curtains over the screen and when they opened it was magic, especially to a little kid. Who cares what was playing, you were at the movies! The first films I remember seeing there were odd live action movies based on Rumpelstiltskin and Puss in Boots, which I recently found out were German and Mexican films, respectively, dubbed into English. The Fairview had Saturday matinees for kids where they showed older movies like the two I just mentioned, as well as, the old Universal Frankenstein and Dracula and The Seventh Voyage Of Sinbad, in addition to it’s first fun features. I remember seeing Escape From The Planet Of The Apes there and The Golden Voyage Of Sinbad when they opened. There were other theaters I went to with my family, like the before mentioned Park Lane and the Linwood theater in Fort Lee, but my first memories of being in a movie theater were here. The first predecessors of the multi-plex showed up in the 70s. For me in New Jersey it was the Stanley Warner Triplex where I saw Star Wars opening weekend and the Century Twin where I saw my first James Bond film in a theater, The Spy Who Loved Me, both in Paramus. And I can’t forget The Showboat Quad in Edgewater N.J. where I saw some B-movie classics like Damnation Alley and The Crater Lake Monster. These theaters still had a bit of their own style, but the proverbial writing was on the wall. The future was starting to arrive, as we approached the 80s, as more multi-plexes opened and some of the old favorites like The Fairview Cinema, Park Lane and Oritani soon became either twins or triplexes to keep up…and already multi-screened The Stanley Warner became a quad and then, over time, grew to a ten-plex before closing in recent years. Some of these multi-screen theaters kept their atmosphere and charm, especially the Park Lane and the grind-house Oritani, but once those places closed and other theaters where chopped up even further, the personality of the local theater became lost as the corporate juggernaut took over and now almost every mall comes with a theater attached with at least ten screens, each theater and their lobbies and auditoriums all looking the same. 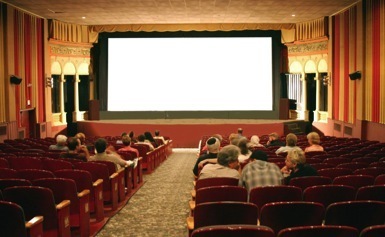 The few remaining local theaters in various towns, like the Westwood Cinema in Westwood, N.J. are all that are left of this bygone era where the experience of movie going was more than top of the line speakers and a waitress bringing you a turkey club wrap. It was about the atmosphere and the personality of the theater you were in. Obviously, as you know, I love movies and I love going to the movies, but the experience isn’t as gratifying as it once was, at least not to me who was there to experience that time where going to the movies still held a romanticism and the theater you went to had it’s own unique style. To those of this new generation who grew up on the mall multi-plex and have never experienced that local theater complete with an actual stage and curtains across the screen, it’s sad that they may never know this wonderful part of the movie going experience. Maybe this doesn’t matter to the casual movie goer, but if you love movies like I do, it can make even the worst movie a special memory. There are still a few of these small local theaters out there…though most, as noted, are now broken up into multiple screens, but still have their charming lobbies, box office booths and an actual marquee in front, something I miss seeing upon approaching a theater…and if you have the opportunity, I suggest you go, even just once, to get an idea of what I am referring to…before all the romance in going to the movies is completely gone. And from my point of view that is something sadly lost no matter how good the movie is. Cozy, isn’t it? The interior of the now closed Rialto Theater in Ridgefield Park. A trailer for Puss In Boots, one of the first movies I remember seeing in a theater when I was a kid. My friends and I had a lot of fun when we saw this cult classic at the legendary Oritani Theater in Hackensack N.J. and it was gleefully for all the wrong reasons most of the time. 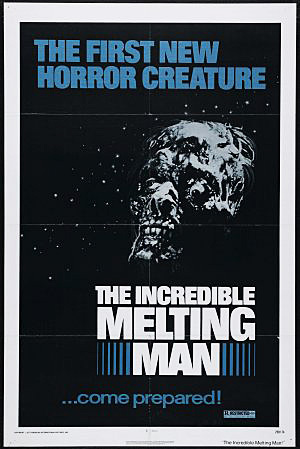 The Incredible Melting Man is a delightfully bad 1977 sci-fi/ horror about ill-fated astronaut Steve West (Alex Rebar) who returns from a space mission exploring Saturn’s rings with a mysterious condition where his flesh is melting and he is radioactive. For some reason, just as mystifying as to how he got this way, (there is a hint it was caused by viewing the sun through Saturn’s rings, but it’s never confirmed.) Steve must consume human flesh to slow down the degeneration. As his mind degenerates, too, West escapes the hospital and begins to chow down on the locals while he is pursued by friend Dr. Ted Nelson (Burr DeBenning) and Air Force General Perry (Myron Healey). As Steve melts more and more, the more locals, including Nelson’s in-laws, fall victim to the stricken astronaut who becomes less and less human by the minute. Can he be stopped? Can the process be reversed? Who will be his next meal? All the questions are answered and if this kind of flick is your thing, you’ll have a fun time watching the answers unfold. Despite it’s less then 90 minute running time the film is methodically paced. There are a lot of scenes of West roaming around the countryside with the last moments of the mission playing over and over in his head while Dr. Nelson follows his trail with his handy geiger counter. Most of the attacks are off camera thought there are plentiful shots of the gory carnage and one great shot of a dismembered head going over a waterfall and smashing on the rocks below. Aside from the gore and melting FX, which were done by the now legendary Rick Baker, there is plenty of hilariously bad dialog and unintentional laugh inducing situations. The film, by writer/director William Sachs (Galaxina), has an uneven tone, though it’s supposedly not all his fault. Sachs claims he wanted something more campy and fun like the sci-fi flicks of the 50s, while the producers wanted a more serious horror flick and these artistic differences give the movie an unbalanced mix of serious moments and much lighter moments. But the thing is, some of the more serious scenes come across as unintentionally funny and some of the humorous scenes meant to be funny, aren’t successful in their attempt and just come across as awkward. So they are very entertaining, but not for the right reasons. Sachs just doesn’t quite have the right touch to mix horror and camp as say, Joe Dante did in Piranha and The Howling though, it would appear that’s what he was going for. But either way, this production’s heart is in the right place and the really cool work by future Oscar winner Baker is very effective…and of course all the intentional and unintentional entertainment it provides, is worth watching it for. The filmmakers were really trying hard here to deliver a new and horrifying movie monster, but the talent (aside from Baker) is just not quite there behind or in front of the camera and the disagreement between director and producers doesn’t help either. The acting is just as bad as the before mentioned dialog and the inept cast stumbling around finding body parts both of the victims and the Melting Man, produce far more laughs then chills. Also, some of the conversations between gore scenes are hilariously inappropriate, given the situations the characters are in and it’s hard to tell how much of this was intentional and how much was not, but it’s entertaining either way, so, ultimately, it doesn’t really matter. To a degree Sachs got the kind of campy fun movie he was trying to make, but it’s not totally on purpose. Made by the legendary American International Pictures, Melting Man has earned cult classic status and has become one of MST3K’s funnier episodes and if you are a connoisseur of ‘so bad it’s good’ cinema then this is a prime example. The added nostalgia of this late 70s flick only makes it even more fun. The kind of movie they sadly don’t make anymore and a personal guilty pleasure of mine. Thankfully Melting Man is now available on a gorgeous extra filled blu-ray from the folks at Scream Factory! Also features cameos by 70s B-Movie regular Cheryl ‘Rainbeaux’ Smith (Laserblast) and acclaimed director Jonathan Demme. MONSTERZERO NJ EXTRA TRIVIA: Rick Baker had some protégées working on this film, future make-up FX legends in their own right, Greg Cannom, Craig Reardon and Rob Bottin! Yet another early 80s gem that I had the pleasure of seeing on the big screen at the great Oritani Theater in Hackensack N.J. This delightfully cheesy sci-fi/ horror flick tells the story of an alien hunter who preys on humans using flying, fanged starfish-like creatures as weapons and a full 7 years before Arnold tangled with the Predator. Without Warning focuses on two young couples (Tarah Nutter, Christopher S. Nelson, Humanoids From The Deep’s Lynn Theel and a young David Caruso) who decide to go camping at a remote lake despite the ominous warnings from strange local gas station owner/hunter, Joe Taylor (Jack Palance before City Slickers revived his career). Soon upon arrival at the secluded lake, they become the targeted prey of the extraterrestrial creature and his flying minions who have apparently staked out this area as their hunting ground. Now running for their lives and with no one believing them, they have only the gruff off-balanced Taylor and crazy war vet and conspiracy theorist “Sarge” (Martin Landau before Ed Wood revived his career) to turn to. Apparently these two have had dealings with this evil E.T. and have been equally ostracized for their claims, so maybe now it’s time to stand and fight. This 1980 film is cheesy fun and brings a lot of unintentional laughs such as one youth’s attempt to describe the alien threat to a bar full of drunk locals and the alien actually stopping to steady a swinging lamp before continuing his pursuit of a victim. Greydon (Satan’s Cheerleaders) Clark directs from a script with no less than 4 writers listed for some reason. He gives the flick a rather pedestrian pace, but he treats his material seriously as do the cast, especially Palance and Landau, who properly chew up the scenery with Landau especially cranking up the nuttiness. Aside from them, though, the acting and dialog is strictly what you’d expect from a B-movie like this and the barely adequate performances suit the material oddly well. The production is strictly low budget with some passable alien SPFX and OK gore from future FX master Greg Cannom with the alien’s head created by the legendary Rick Baker. There isn’t a lot of action till the last act, but it is entertainingly worth waiting for and the fact that everyone in the small lakeside town seems to be some kind of nut does go a long way to make up for it in the meantime. And who can pass on a three-way showdown between Jack Palance, Martin Landau and a 7 foot purple alien? Not me! Add in a typical 80s electronic score by Dan Wyman and some nice cinematography by frequent John Carpenter DOP Dean Cundey and you have a good example of the type of B-movie they sadly don’t make anymore. Despite all it’s inadequacies, it’s heart is in the right place. Not a classic or great movie by any length, but it is a fun 80s ‘so bad it’s good’ flick to enjoy with a couple of beers and a few other flicks of equally enjoyable awfulness (like Laserblast for example). Without Warning also features appearances by film vets Ralph Meeker and Neville Brand as doubting locals and Cameron Mitchell and Larry Storch as a hunter and scout master, respectively, who are among the creature’s first victims. Nostalgic 80s fun. MONSTERZERO NJ EXTRA TRIVIA: Ironically, the alien hunter here is played by Kevin Peter Hall who also played the Predator in the similarly themed, classic Schwarzenegger flick in 1987. For an in-depth comparison of Without Warning and Predator, go HERE to read all about it. 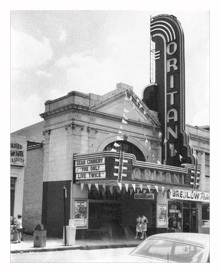 A SPECIAL PLACE: THE ORITANI THEATER IN HACKENSACK, N.J.
A SPECIAL PLACE: THE ORITANI THEATER IN HACKENSACK, N.J. by MonsterZero N.J.
Grind-house is a term used to describe a movie theater that showed low budget exploitation films as opposed to more mainstream movies. The Oritani triplex in Hackensack N.J. could definitely be described as a grind-house, presenting badly dubbed martial arts, horror, and raunchy low budget comedies. I was fortunate enough to have experienced seeing a lot of great exploitation films on it’s screens before the video age killed the grind-house and these movies went direct to videotape and now DVD. My first visit to the Oritani Theater was in 1976. It was still a single auditorium theater at that point and my parents took me there to see the cheesy rubber monster-fest, “At The Earth’s Core” which was on a double feature with the sci-fi/horror “Bug”. It was an odd double feature and a herald of things to come. I would venture there a few more times to see delightfully cheesy fair like “The Incredible Melting Man”, but it wasn’t till a few years later when visiting the Oritani would become an almost weekly occurrence. I started high school in 1979 as a new kid in Ridgefield Park N.J., a small town where everyone grew up together. My parents had divorced and my mother remarried and we relocated there to live with my new stepfather. I was an outcast at first and it was the other outcasts that I bonded with as friends. My pals Roger, Ray and Dorian all held similar interests and movies was one of them. Ray especially was a big horror and gore movie fan and I wonder if he still is. We weren’t old enough to drive and Hackensack was in walking distance, so Friday and Saturday nights were spent walking along the railroad tracks that paralleled the Hackensack River into town and onto Main St, where the Oritani theater was located. The Oritani was now split into a triplex, so there was at least three movies to choose from each week, more with the occasional double feature. If the weather was bad, Ray’s grandfather drove us, so we were there almost every weekend, sometimes twice. There was always something playing there to catch our interest. Worse came to worse, there was the Fox theater across the street, which showed it’s share of exploitation flicks, too. Obviously what we saw there was a mixed bag. I remember seeing the classic “Shogun Assassin”, as well as, one of my all time favorites, “Escape from New York”. But for every future classic, there was a “Final Exam” or a “Revenge of the Shogun Women in 3D” which evoked more laughs and mockery then chills and thrills. I discovered the films of David Cronenberg watching “Scanners” there. My first exposure to Cronenberg’s work and he has become one of my favorite filmmakers. Got to see some early Charles Band productions there like “Laserblast” and “The Day Time Ended” before he embraced DTV and started making films specifically for the home video market. I also saw “Mad Max” there starring a then unknown Mel Gibson, which was on an odd double feature with “Humanoids from the Deep”, another great B movie from Roger Corman, whose movie productions I love. I saw Corman’s answer to “Star Wars” and “Alien” respectively, “Battle Beyond the Stars” and “Galaxy of Terror” at this special theater, too. Both had production design by a then unknown James Cameron who went on to direct “Terminator”, “Aliens” and “Titanic”. Future memories formed watching future stars. You’d be surprised how many acclaimed actors and filmmakers had their start in these movies…whether they acknowledge it or not. The audience at the Oritani was as diverse as the selection of flicks and these movies brought everybody together to laugh and shout comments at the screen as one audience. Whether it was to challenge a master’s skill in “Kill and Kill Again” or question the threat factor of one of “The Boogens”, the audience became part of the film. Some of the comments heard were better than the film viewed and I will never forget them. When the film broke before an epic battle in “Shogun Assassin” and restarted after the fight ended… well, you had to be there. I’m glad I was. Even when I revisit that B-movie classic today, it doesn’t seem quite the same with that jarring bit of missing footage now intact. Unfortunately, video tape came along and exploitation film studios realized it was cheaper to release things directly on tape than to spend money on prints and advertising. The grind-house died and the Oritani died with it. There are now a couple of stores standing where the Oritani used to be and I can’t name one of them. Don’t care to. I wish I could name the last thing I saw there*, but in it’s final run, the Oritani tried to save itself by becoming more of a mainstream movie house, so we stopped going. By then we were old enough to drive and could see these mainstream movies on a newer, bigger screen with better sound. I remember one night coming out of the Fox theater, we might have gone there to see John Carpenter’s “The Thing”, and I gazed across the street to see the Oritani marquee and feeling sad that “E.T”. was playing there and not some cool exploitation flick or low budget horror. Maybe in my heart I knew at that moment that those days were now gone and to an extent, so was the Oritani I knew and loved. And sadly, it was. The Oritani closed in 1983, the year I graduated high school. Perhaps a bit symbolic of the end of my youth, or at the very least, the end of an era. I will never forget this special theater nor the impact it had on me as a movie lover. I cherish the memories of all the great B-Movies I discovered there, seeing them on the big screen where they belong. The spirit of the Oritani Theater still lives within this movie geek, though and on many a quiet Saturday night I get a six pack of my favorite brew and pull some of the great B-movies first seen there from out of the collection and relive some of the memories of that very special place.